One of the most exciting advances in the field of refractive surgery involves the application of Wavefront testing to the human eye. The basis of Wavefront testing is from the field of adaptive optics, used for years by astronomers to build better lens systems for improving the optics of telescopes. The human eye has two broad categories of aberrations, lower order, and higher order. Lower order aberrations represent the patient’s prescription for glasses. There are many higher order aberrations but the two most important ones for potential LASIK patients are spherical aberration and Coma. When these two aberrations are increased above preparative levels, patients may notice more problems with the quality of their night vision and be more aware of halos, starburst, flare, and glare. Conventional laser eye surgery (LASIK and PRK) for years was excellent at reducing or eliminating the lower order aberrations and most patients obtained satisfactory uncorrected vision, usually near 20/20. However, conventional laser eye surgery procedures like LASIK and PRK have often increased the degree of higher order aberrations, which accounted for the possible increased likelihood of night vision problems. for both LASIK and PRK in an attempt to either cut or at least reduce the increase of higher order aberrations. All of the FDA-approved laser systems for LASIK and PRK now offer this type of treatment, so that each patient’s optical system is measured more accurately than ever before, producing in effect a unique “fingerprint” of their pre-operative visual problems. 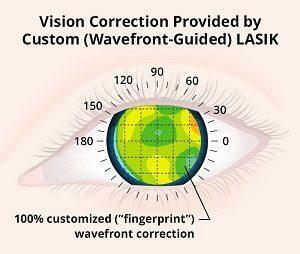 This truly customized treatment plan is then implemented in the laser eye surgery (LASIK, PRK) for each patient. This Wavefront fingerprint enables the laser eye surgeon to program the laser in order to get the best results for the laser eye surgery that is best for you. By using Wavefront testing, there is a possibility that your existing higher order aberrations may not increase at all, and some patients report that they can see even better than they did with glasses or contact lenses. This is called again in best spectacle-corrected visual acuity. The FDA studies of Wavefront based treatments in LASIK, PRK, and other laser eye procedures have improved the chance of obtaining 20/20 vision or better and have decreased the chances of significant night vision problems.